In 1979, before there was the Internet, Black + Decker unveiled the DustBuster series. More than three decades later, the series is still going strong. In fact, in some regions, “DustBuster” has become a genericized trademark for handheld vacuum cleaner. This is due to its worldwide recognition (over 100 million units sold) and successful design. The Black Decker CHV1410L retains the signature DustBuster design, albeit with a modern refresh. However, its design is only one reason for its remarkable success story. The biggest draws of the Black Decker CHV1410L are its powerful suction and impressive battery technology. Other highlight features of the CHV1410L are its lightweight, high-end performance, ease of use, and low maintenance. Together, these outstanding features and more confer on the CHV1410L its befitting status as the best car vacuum currently on the market. Why You Should Buy the Black Decker CHV1410L? Suction has long been a bane of handheld vacs. It is either not enough or fades with continuous usage. The CHV1410L Lithium Cordless DustBuster eliminates these suction letdowns of common hand vacs. On one hand, its 4-amps motor guarantees sufficient suction that rivals that of many upright vacs. On the other hand, thanks to the proprietary cyclonic action technology and lithium-ion battery, the suction levels remain strong throughout the duration of your cleaning session. 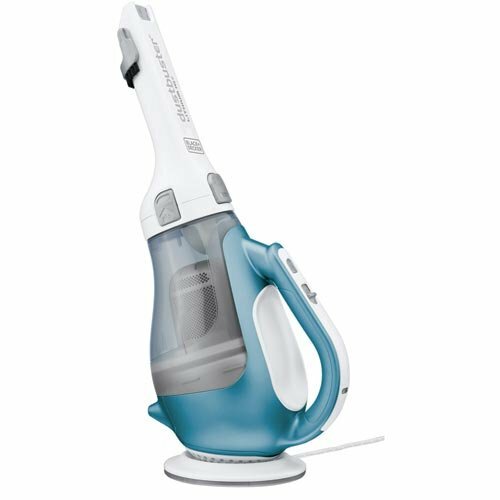 Accordingly, the Black + Decker CHV1410L 16 Volt Lithium Cordless Dust Buster Hand Vacuum is the ideal hand vac you need to maintain a clean car interior. It is able to take up different types of debris and dirt of common sizes. These include the regular minute dust and even much bigger debris such as cereals. More importantly, it is able to clean these trashes from a large array of surfaces. Car carpets, mats, seats, and just about any other surface in your car interior. The CHV1410L is a cordless, bag-less hand vac. Thus, it is the poster child of convenience on the Dust Buster lineup. Black + Decker follow the times by doing away with its legacy Nickel-Cadmium (Ni-Cd) batteries, that have had their fair share of the limelight. On the new-gen cordless Dust Busters including the CHV1410L, the more advantageous Lithium-ion battery makes a showdown. Ni-Cd batteries are unable to hold a charge for a long time. For example, a fully charged Ni-Cd battery left for days would inevitably lose some of its charge you gradually before you use it. The Li-ion battery on the CHV1410L has higher fidelity. After charging it fully, it is able to hold the 100% charge for up to 18 months before losing any of its charge. This is great for car owners as you can store the vac in your car and whip it up whenever you need it on the go without worrying about passive charge depletion. Furthermore, the infamous memory effect of Ni-Cd battery-operated hand vacs is absent on the CHV1410L 16V Cordless vac. You need not hope for consistent good performance whenever you want to vacuum; you know you would get consistent terrific performance. In addition to these improvements by switching to a better battery technology, the Black + Decker CHV1410L 16 Volt Lithium Cordless Dust Buster Handheld Vacuum features an inbuilt proprietary smart charge technology. Thus, you do not have to worry about leaving it plugged in or the deleterious effect of overcharging; as the battery would automatically stop charging when it is full. The CHV1410L is bag-less. This means that you do not have to change bags, you only have to empty the dirt tank when full. The added perk of this setup is that there are no added expenses for stocking bags. The 20.6 oz. dirt tank on the CHV1410L is transparent. Thus, it allows you to know visually when the tank is full and needs emptying. This is a plus on both the ease of use and maintenance fronts. The highlight of its seamless maintenance is how easy it is to empty the dirt tank. All you need to do is press in the tabs, it unlocks, and then you can take out the dirt tank to empty in a trashcan. The filters on the device are machine washable, so you do not have to replace them often. Complementing the washable feature, the proprietary cyclonic action technology spins dust and debris away from the filter. This has the dual benefit of ensuring steady high suction and a less clogged filter that needs frequent washing/changing. It is good that the CHV1410L has attachments to extend its functionality. It is better that these attachments are built-in. It is best that these integrated attachments have sturdy design and are a snap to use. Thus, you do not have to worry about losing the attachments, nor should you be concerned about how well they fit; because they are an integral part of the build. Powerful Suction – The CHV1410L sports a suction that pits it against upright vacs that cost more than 3 times more. This is thanks to a 4-amps motor, 16-volt max, and air watts of 18.2 watts. Terrific Battery Life – The Lithium-ion battery lasts for the average car cleaning session, which is an awesome departure from the inept battery life of Ni-Cd-powered handheld vacuums. Smart Charge Technology – This technology builds on the improved Li-ion battery by, amongst other things, preventing overcharging. Easy Usage – Its lightweight (weighing only 2.6 pounds), compact build, rotating nozzle that picks 50% more dirt than on previous models, and on board attachments; the CHV1410L is a pleasure to use. Easy Clean – You can easily detach the dirt tank for quick emptying. Furthermore, you can wash the dirt tank for a more thorough clean. Additionally, you can wash the filter manually or using a machine. This increases the durability and eliminates the need to change filters frequently. Only a few devices in consumer electronics deserve the “close to perfect” tag. The Black & Decker CHV1410L Hand Vacuum belongs to the elite class of devices that deserve the tag. The evidence is its coveted bestseller status. The reason is its recipe of impressive features at an attractive price tag that would leave you wanting for nothing else. It is undoubtedly the best handheld vacuum cleaner for cars.